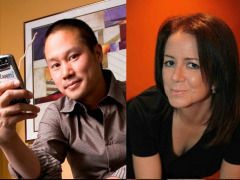 TONY HSIEH, CEO of Zappos, is one of today’s most successful and visionary business leaders. In 1996, he co-founded a Website development side business from his apartment; two and a half years later, he sold LinkExchange to Microsoft for $265 million. In November 1999, he joined a struggling online shoe store as an adviser and investor. Named CEO in 2000, he helped Zappos grow to over $1 billion in gross merchandise sales annually, while continually strengthening its customer service and culture. LISA NAPOLI is the author of the upcoming book, RADIO SHANGRI-LA: What I Learned in Bhutan, the Happiest Kingdom on Earth (CROWN: Feb. 2011). It's about how she went to help start a radio station in the mysterious nation during a transition time in its history, and in her own life. Over her 25 year career in media, Napoli has worked for the NY Times, MSNBC, CNN, and the public radio show Marketplace. The Drucker Business Forum is produced by the Peter F. Drucker and Masatoshi Ito Graduate School of Management with additional support from the Pearson Foundation.